Reign: 790-802 CE, at the height of the Greenworld Renaissance. Relevant Volume of The Histories of the Wonderful and Terrible Age of Gods and Heroes: "Vol. 3, War of the Three Empires"
History: From the apocalyptic destruction of the War of the Giants, the world eventually recovered and the true power, and horror, of Godheads and the Crimson Emperor eventually faded into myth. The people of the Greenworld had long considered both the Ancient Empire and the Age of the Highborn to be part of a fantastical, legendary prehistory. Only after the fall of the second Crimson Emperor, and with the rebuilding of civilization across their ruined world, do the recorded histories begin. Following the defeat of Vaeshiva Regaulde, the civilizations of the world had to rebuild from scratch, and so the barbarian descendants of the war's survivors struggled and fought through a thousand-year dark age. From this time of strife emerged three empires descended from three tribes--the Ostraden, Gallifacti, and Merzhian--that would continue to dominate Greenworld politics, in one way or another, up through to the modern day. In the lands surrounding the Middle-Sea, "Belnesaria" in old Solandilean, the Ostraden barbarians rose to prominence following a series of successful conquests and the building of a grand tribal coalition. The Oulinshan who once ruled this portion of the world were conquered and assimilated, but the Ostraden tribes quickly took to their customs, culture, and penchant for scholarship. The survivors of Solandilea were fiercely independent, but the conqueror-chief of the Ostrades was both mighty and cunning. They, too, were conquered and assimilated, and their warrior ethic meshed well with the barbarian spirit. The architect of this new federation of allied and vassal tribes was one charismatic and ambitious chieftain, who was crowned the First King of the Middle-Sea by her people. She was called Chessaly Sophaius, the Lawgiver, and creator of that which historians call the Old Belnesarian Empire. The territory of Old Belnesaria covered the lands surrounding (what we would call) the Mediterranean, as well as most of Europe and much of the Near East. To the far south in their world's equivalent of southern Africa, from the Gallifact tribe emerged a young demigod named Izant, son of Deltengal. From his humble origins as a hunter's son, Izant rose to command not only the Gallifacti, but all of their neighbors and rivals. Under his leadership, they conquered the tribes of Sildane Highborn to their north and coerced the city-state of Vardespia--a remnant of the Solandilean exodus--into submitting to his divine will. Within the span of only one mortal lifetime--a merest moment for the Avatars of the Gods--over half the continent was under his control. Izant petitioned the Celestials to recognize him as one of them, a reincarnated God and veteran hero of the rebellion against the Crimson Emperor, and when they saw the extent of his conquests they had no choice but to acknowledge his rightful place. In an act of both great pride and disarming frankness, he named his new empire after himself: The Izant Empire. Through the entire history of the original Izant Empire, the descendants of the Gallifacti had only one ruler--their God. Izant's trade and diplomacy with the Celestials gave his empire a distinct economic and technological advantage over its rivals, enough that it was considered a second Sol Andilea. Izant, himself, took great pride in learning and science, and would be remembered as the greatest scholar and emperor in Terran history. In the northeast, spanning all of northern Europe and Asia by Gaian reckoning, rested the Great Zandalen Empire. Forged from the hard-won victories of a hundred campaigns, the Zandalen Empire was the youngest of the three superpowers and the most aggressive. Founded by the Merzhian nomads of the steppes, the name Zandalen itself means "Our Plains" in the Merzchen tongue. For the first half of their history, Zandalen politics was wracked with chaos and civil war, as the steppe chieftains often turned on each other following the death of their previous Emperor. That all changed with the coronation of the chieftain Valdmeria, daughter of Luchszand, who revolutionized their feudal government under a powerful central authority, whose influence and reach was expanded greatly by most sophisticated communications and logistical network in the Greenworld's history. Under Valdmeria's reign, the Zandalenes modernized their cavalry and tactics, and pushed the infantry-heavy Auroch Highborn out of Asia and across the sea into the Americas. The Luchszandre dynasty would continue for a thousand years, unthinkable for a merely mortal royal family. But it was the last Prince of Luchszandre that would end the age of the three superpowers. In the year 789, the immortal God-King Izant and the three successor-candidates of the late Emperor Auldencrantz Luchszandre competed for dominance of the Old World. The Izant Empire seemed poised to take the entire world, backed by the Celestials and led by an Avatar of one of the fearsome Godheads of ancient times. The Zandalen Empire, slowly suffering from a trade embargo enforced by the Celestials and unfairly disadvantaged by this heavenly meddling, redoubled their efforts to stop Izant and force the Celestials to cease interfering with their world. The Belnesarian Empire, on the other hand, was caught between the two sides, and was holding onto valuable and wealthy lands coveted by all. Both the Izantines and Zandalenes made a secret pact to split the lands of the Middle-Sea between them, though neither had any intention of living up to their side of the bargain. The two rival empires launched their invasions into Belnesarian soil and quickly made their way to the capital, Ostradia, which withstood a week-long siege and bombardment. Then the invaders were ambushed by a Belnesarian relief force while simultaneously suffering from sabotage across their skyship fleets, and soon their siege broke into a rout. Over the course of the year, the invaders were forced out of the Middle-Sea and back into their own lands, and it became clear that not only were the Belnesarians sorely underestimated, they had a secret weapon. The King of Belnesaria, Millia Sophaius, placed great trust in a certain companion, who was the King's most capable spy and a devious tactician. This spy was a defector from the Zandalen Empire, who had escaped from the venomous court intrigues of Czensecrant and possessed intelligence on the Izantines straight from the bureau of the late Emperor Auldencrantz himself. The military secrets of both of the other Empires were in the hands of the Belnesarians, and this kept the two in check. But of the two, Izant's forces were the most reluctant to retreat from the Middle-Sea. While the Zandalen fleets quickly fled, thanks to the speed of their communications and a marked interest in self-preservation, King Izant fought back each step of the way--while he was a learned and studious demigod, he was also a proud demigod. As it became clear that Izant's forces had suffered enough casualties to put them at serious risk against a Zandalene sneak attack, the Celestial Republic intervened so as to protect their chosen "pet kingdom." They forced King Izant to back down and brought King Sophaius to the negotiating table. The Celestials threatened to annihilate both Belnesaria and Izant alike if they refused to cooperate against the Zandalen Empire, trapping their people in an eternal winter. Precisely why the Celestials saw the Zandalenes as such a threat, and what sort of magic or weapon they would use if their demands were not met, were revealed over the course of one fateful night. When the King of Belnesaria was brought to the palace of God-King Izant, as per the Celestials' demands, a scheme within the Zandalene court was set into motion. Just a week before, the Crown Prince Zordannian Luchszandre, commander of the main expeditionary fleet during the Belnesarian invasion, was assassinated. His younger sister, the Prince Roszandin, was found guilty of the murder through evidence suggesting that this was the work of her own agents. She was openly disgusted at his cowardice during the campaign, and felt he was unworthy to be considered a potential successor of their father's legacy. In retaliation, the nobles of the Zandalen Empire had her stripped of her authority and exiled, leaving the youngest Prince, Zannancszer, as the only beneficiary to Auldencrantz's will--all according to his plans. To allay suspicion and to prove he was more capable than his womanizing image implied, he refused the position of heir apparent and volunteered to instead serve the Imperial Household from within its ranks rather than ruling from above. Zannancszer was not known as a leader or a warrior, for his studies as an Imperial Prince were always focused on the subject of wine, women, and song--hardly the qualifications for As part of this strategy, he personally led his own spies and agents deep within the heart of Izantine territory in order to find and capture or destroy this new Celestial super-weapon. During the negotiations between the Kings Izant and Sophaius, Zannanczser and his retainers uncovered a dreadful device. The Celestials had recovered a design for a Godspear-class strategic asset from the ruined vaults of the Ancient Empire, one of such power that its effects would linger for aeons after its use. While Godheads can raze continents, eventually the land can recover and life might begin anew. This weapon, dubbed the "Oblivion Signal," could trap a world in a state of frozen un-life for millennia. And unlike Godheads, this weapon did not require vast amounts of magical resources for fuel. It was merely a bomb, a disposable thing, and capable of freezing all life and magic wherever it touched. The Celestials kept one beneath Izant's palace as a form of insurance, and they had more. The deployment of an Oblivion Signal meant that the Celestial Republic was not concerned with conquering land, resources, or people--its only use was to utterly and completely destroy its target, preventing any hope of recovery or reclamation, no matter the cost. This, it is believed, is why Prince Zannancszer sought to claim the weapon for the Zandalenes. If they could build their own Oblivion Signals, they could deter the deployment of these weapons with the threat of mutually assured destruction. Should the Celestials unleash these devices, they would find themselves met with equal force. To the Celestial Republic, this was unacceptable. When they discovered that the weapon had been stolen, they detonated it before its magics could be completely disarmed and reverse-engineered. As Prince Zannancszer was in the process of disabling the Oblivion Signal, he was caught in the epicenter of the blast. Fortunately for the people of Izant, the power of the Oblivion Signal was mostly contained and spread slowly, allowing the populace time to escape as the weapon gradually devoured their homes. God-King Izant, in a rage, nearly declared war upon the Celestial Republic for its actions, but the Sentinels--the Celestial agency responsible for the incident--gave a cold and somber justification. The mystics and scholars of the Republic had evidence that the Crimson Emperor had recently reincarnated within the Great Zandalen Empire. Had the Oblivion Signal, brought as a final resort against the God-Emperor Regalia, fallen into his hands then the known worlds would have been put at risk. The destruction wrought during the War of the Giants would have paled in comparison. King Sophaius, while shaken, set aside her qualms and agreed to combine forces with Izant against the Zandalenes if it would prevent another return of the Crimson Emperor. Meanwhile, Prince Zannancszer escaped from the site of the detonation, his arms ruined and withered from attempting to hold back the energies of the Oblivion Signal. His entire body would have been destroyed had the trauma of the incident not awakened his inner potential--the God-Emperor Regalia activated that night, saving his life and those of a few of his more fortunate retainers. He returned to the Zandalen with both dire news and a thirst for vengeance. In the year 790, the Great Zandalen Empire mobilized to overrun the Celestials' puppet states and complete its bid for dominance of the world. Armed with righteous ferver and the divine might of the God-Emperor by their side, the Zandalenes launched a risky invasion of two simultaneous theatres: Belnesaria from the skies over the continent and Izant from the skies over the Southern Sea (Indian Ocean). This was made possible by the Zandalen Empire's own Godhead, the Crimson Imperial Regalia, and the Celestials' reluctance to field their own Godheads. This allowed Prince Zannancszer, the commander of the invasion fleets, to project his Godhead's power across vast distances unchecked by other Gods or high-tier divine defenses. While Vaeshiva Regaulde's powers were weaker than Oltimas Saramcarm's, and Zannancszer's were weaker still, the Crimson Emperor still possessed enough strength to provide accurate air support for dozens of operations halfway across the globe. While lacking the raw, cataclysmic might of the Godspear Arrays, Zannancszer could still send lances of light and arrows of flame to wither and weaken his enemies' forces and disrupt their ability to wage their defensive war against him. Rather than risk another War of Giants or the deployment of the Republic's arsenal of Oblivion Signals, God-King Izant declared his intention to neutralize the Crimson Emperor himself, defanging the invasion and removing the need to unleash such terrible destruction on the world. The perfect weapon for the task was the Sword of Holy Flowers, again held safe in the vaults of the Republic's capital, Ishan Yuga. However, much to the dismay of the anti-Crimson coalition leaders, the Sword seemed to prefer only one wielder, the Saint Alunesca. While it would allow the worthy to wield a fraction of its might, it grew more and more attached to the Swordbearer it first chose. Izant was worthy enough to take the sword in hand, but he could not command its full power. The reborn Saint Alunesca was not far but she was reluctant to step forward. Her position as the Belnesarian King's personal spymaster gave her unique insight on the politics of Heaven and Earth, and she did not trust the wisdom of the Celestial Republic manipulating this war. God-King Izant set aside his prideful ambitions as a world-conqueror and willingly took the Swordbearer's place as the hero to lead the fight against the Crimson Emperor--the sword's acceptance of him was proof of his sincerity. He could also summon his own Godhead as well. While Izant's Godhead was not of the same caliber as Zannancszer's, it was the only one the coalition was willing or able to deploy. God-King Izant and King Sophaius had to fight to prove to Heaven that the Crimson Emperor could be stopped without having to call down the apocalypse upon them all. The war between the Zandalene Empire and the Izant-Belnesarian Alliance lasted ten years. Millions perished in the fighting, and whole cities were lost to dust and ashes. The Alliance was losing, and the Celestials grew increasingly wary. Prince Zannancszer remained uncrowned, for he bore the title of Crimson Emperor and it was his wish to keep the dignity of the Zandalen throne separate from the bloody history of his own past lives. The Zandalen Empire embarked on a bold, some believe suicidal, operation to capture Izant and Belnesaria's most precious places of power, their "divine loci." These were structures of such magical and divine strength that they would allow the Zandalenes to possibly intercept the Celestials' forces as they deploy their doomsday weapons, preventing a worst-case scenario and giving Zannancszer access to enough raw magical resources that he could begin fielding more and more Godheads, and fight a second War of Giants on Celestial soil if things came to that. The Celestials would wish to prevent that by any means necessary, no matter the cost. The worst-case scenario would be if the Celestials decided to end the world before the Zandalene forces could even reach their objective. In the defense of the divine magic loci, the coalition fought desperately. God-King Izant fell that day, along with hundreds of thousands of coalition soldiers, and Zannancszer had the divine loci within his grasp. But before he could consolidate his victory, the God-Emperor Regalia suffered a massive hardware failure. The Belnesarian spymaster had taken the Sword from Izant's hands and struck Zannancszer's Godhead in a critical spot. This shut off its magical arsenal, allowing the coalition forces to regroup and push the young Crimson Emperor back. It seemed as though the Swordbearer had shed her fears and taken her rightful place as the Emperor's nemesis. However, the Celestial Republic grew concerned with her, as well. They knew the God-King Izant, their puppet monarch, had grown to resent the Republic for its meddling with the world's affairs, and he never forgave the Celestial Sentinels for their part in the destruction of his homeland. As it turned out, he and the reincarnated Alunesca shared a common distrust of the Republic and its governance, and over the course of the war had secretly been training her how to fight not only Zannancszer's forces, but how to fight the Celestials' as well. This unfortunately made the Saint an unacceptable risk to the Republic. So the Sentinels, the spies and assassins of the Celestial Republic, devised a plan that would secure the future of the Republic by both removing the threat of a temporarily disobedient Swordbearer and permanently destroying the Crimson Emperor. During the Celestial-led counterattack into the Zandalen Empire's lands, the Swordbearer was to strike Zannancszer down with the Hepatica Celestian, this would seal his divine might in place. The Swordbearer and coalition forces would retreat while the Sword's seal kept the Emperor bound, and a hundred and eight Oblivion Signals would be dropped on his position. So many focused Motes of Destruction in one place, funneled through the power of the Holy Sword, would theoretically be able to tear apart even a God. The Crimson Emperor would be no more, and would never return to trouble the worlds of humankind again. When the time came to fight the final battle of the Zandalen War, the Alliance forces converged on the capital of Zandalen, the glorious city of Czensecrant. There, Prince Zannancszer made his last stand and was cut down by the Saint Alunesca Reborn. And when the telling blow was confirmed, the Celestials dropped the Oblivion Signals upon them all. Zannancszer, Alunesca, and the Alliance forces and leaders--including the Belnesarian King Sophaius--all perished. The city of Czensecrant became a frozen graveyard, trapped in an eternal winter, where even the spark of magic would die. The fallout from the Oblivion Signals corrupted nearly all of the Zandalen Empire's lands, spilled out into Belnesaria in the west and the north pole to seep into the New World. But though all the billions of lives lost, the Gods of the Celestial Republic felt the sacrifices, while keenly felt, were justified by a future in which the Crimson Emperor would no longer be reborn. As the war ended, the Celestial Republic believed it would have ample time to rebuild this broken world. And the Crimson Emperor would return once again less than 800 years later. There is an unfortunate resemblence of wardrobe choice between him and Index-Librorum-Prohibitorum. I know its the arab look, but still. No, you're right. 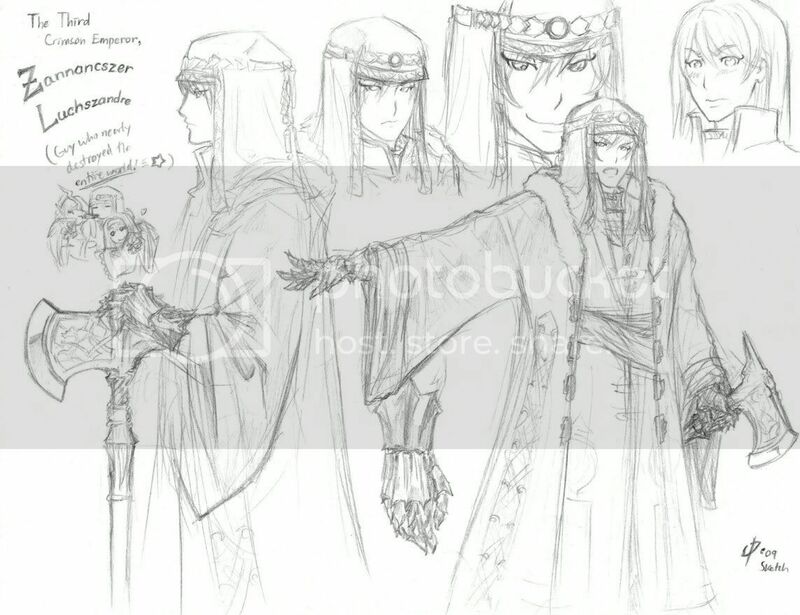 His design was basically Man-Index with Sauron hands. Also, you're missing words in the opening paragraph of Oblivion Signal.